Summary: Georgia’s new Uniform Power of Attorney Act goes into effect July 1, 2017. The Act addresses the contents of the Financial Power of Attorney form, when the form can be used, and when third parties should accept the form. If you drafted a financial Power of Attorney form prior to July 1, 2017, the form will continue to be valid. But it is still a good idea to revisit the form to make sure it meets the new requirements, and that your wishes are still being honored. Georgia’s new “Uniform Power of Attorney Act” goes into effect July 1st. The act aims to modernize the state’s Power of Attorney statute by governing the required contents of the form, when it can be used, and when third parties should accept the form. A Power of Attorney is a document in which one person grants another person the authority to act in his or her place concerning financial or business matters if the grantor is sick or otherwise incapacitated. In other words, the person granted Power of Attorney can make sure the bills are paid and financial issues are handled appropriately. Absent a Power of Attorney, a court may appoint a conservator to handle any economic issues or decide for itself what happens to the financial or business assets. Georgia’s new Uniform Power of Attorney Act, or HB 221, outlines the requirements necessary for the new Financial Power of Attorney form. The Act defines power of attorney, details when it is applicable or effective, and describes when and how the power of attorney terminates. The Act also specifies the duties, liabilities, and authority for Power of Attorney agents, co-agents, and successor agents. The Uniform Power of Attorney Act is designed to encourage third parties (ex: banks and other financial institutions) to accept a valid financial Power of Attorney. (Previously, some of these third parties had been rejecting the standardized forms in favor of their own forms and individual requirements). The act provides for certain time periods in which institutions must respond and requires institutions that wrongfully reject a Power of Attorney to pay attorney’s fees if the Power of Attorney is enforced in court. The Act also provides increased protection against so-called “bad agents,” those who abuse the financial and business authority granted to them by the Power of Attorney. How does this affect me? If you properly executed a financial Power of Attorney form prior to July 1, 2017, that Power of Attorney will continue to be valid. However, it is still a good idea to revisit the form to make sure the language meets the current requirements, and that your wishes are still being honored. (Ex: your financial status may have changed since you signed a Power of Attorney, or you might want to change the person designed as Power of Attorney). 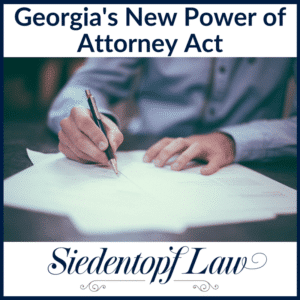 If you have any questions about the Uniform Power of Attorney Act, if you want to verify that your current Power of Attorney form is still valid, or if you would like to create a Power of Attorney for the first time, contact Siedentopf Law via our website EstateLawAtlanta.com or call us today at (404) 736 – 6066. Interested in this topic? Check out our video! Georgia Estate Planning and Probate Attorney Sarah Siedentopf discusses Georgia’s new Power of Attorney Law, OCGA Title 10 Chapter 6b.